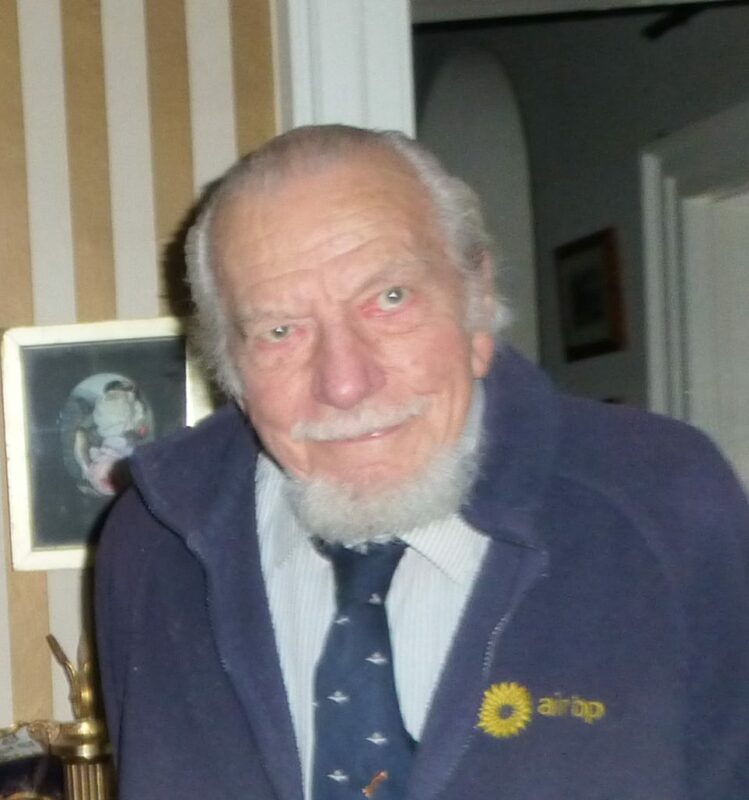 Wing Commander Ken Wallis was a skilled inventor and passionate aviator, who flew well into his 90’s. From a young age, he was determined to fly despite being turned down by the Royal Air Force Volunteer Reserve due to a defect in his right eye. Ken’s impaired vision did not stop him from earning his private pilot’s license in a quick 12 hours and 10 minutes. In 1939, he succeeded in successfully joined the Royal Air Force after cheating on his eye exam, reading the letters off the chart with his left eye while the doctor’s back was turned. Ken flew his first tour of duty with No. 103 Squadron, a night bomber unit which carried out missions over Germany and other areas of German-occupied Europe for the entire war. After completing one tour of duty, Ken returned to front-line duty with No. 37 Squadron in Italy, also flying Wellingtons. Both units suffered terrible losses through the war. Although Ken’s luck and skill as a pilot saw him through several potentially fatal plane crashes, his first captain and five of his subsequent second pilots were killed in action. In his first brush with death, Ken was returning from a mission when a massive fog bank rolled in over England. All returning planes were ordered to Scotland, but as Ken’s Wellington did not have enough fuel to make it there, he and his crew bailed out. As the last one out, Ken was about to lower himself through the escape hatch when he found his parachute snagged on a lever on the pilot’s seat. If he had jumped then, he would have been caught dangling under the doomed bomber. Luckily, he was able to untangle the parachute and jump with just enough height to unfurl it before hitting the ground and injuring his back. While he languished in pain until morning in a noble estate in the area, left both hungry and thirsty, his crew were entertained heartily by local workers in their cottages until the sun came up and they returned to their base. During his next close call, Ken flew his Wellington into one of the many barrage balloons tethered above English towns to protect them from enemy bombers, but which instead, in the typically British miserable weather and low visibility, managed to bring down more British planes than German ones. Already down one engine at the end of their mission, the Wellington’s wing and fuel lines were cut by balloon’s steel cable, nearly causing the plane to stall. The cable miraculously released just in time to allow Ken to crash his bomber feet from the edge a convenient nearby cliff. Fortunately, the plane did not catch fire. During the herculean efforts to land his plane safely in the blacked-out darkness, Ken’s fingers were sliced by the throttle cables and his face smashed into the windshield, adding significant lifelong hand injuries to his permanent back and eye problems. In another hair-raising escape, a stray reconnaissance flare meant to lay a path for following bombers on a mission to Bremen became trapped inside his Wellington, which was carrying an incendiary bomb load. Ken’s crew quickly advised him to jettison the load, which had started to burn. Although he quickly pulled the release lever, sending the bombs through his bomb bay doors, the resulting flames ate away at the body of the plane on the return trip to England. The fire burned the skin of the plane and melted many integral parts of its skeleton, but the unique geodesic design of the Wellington provided enough structural integrity for Ken and his crew to return safely over the Channel. During his RAF career, Ken also worked in weapons testing and development, an area of fascination for him. For a short while, he shared an office with Harold J. Turpin, one of the men who had designed the STEN gun, a crude but effective British submachine gun that was easy and inexpensive to make. Ken took the opportunity to show Turpin his pride and joy, three tiny miniature working pistols he had fashioned by hand, along with the near-microscopic ammunition that accompanied them. After the war, Ken spent two years in America with the U.S. Strategic Air Command flying B-36’s, the largest piston-fired plane ever made . He completed his service in the Royal Air Force in 1964, though his career as both a pilot and an inventor was far from over. In his retirement, Wallis turned his attention to inventing a new sort of open-air, personal aircraft in 1961, the Wallis autogyro. The aircraft featured in the James Bond film You Only Live Twice, and Ken was pleased to fly it on set as a stunt double for Sean Connery., He then went on to set 34 world records for speed in the autogryo (17 of which he still held at the time of his death). When interviewed for the World War II History Project at the age of 96, he was still flying his “harem” of autogyros around his estate and neighborhood. He passed away a little over a year later on September 1st, 2013. Date of Interview: May 12, 2012.